Date of 31st Convocation of IGNOU University has been decided by IGNOU. Students are required to fill 31st Convocation Registration Form online. To get certificate students have to pay an online fee of Rs. 600/- per certificate. Students of MBA, MCA, M.COM, BTCM, BNS, etc. who have qualified in for more than one course/module of the programme are required to pay Rs. 600/- for each certificate. Last Date of filling online form is 30th June 2018. So students have to register before 30 June without any delay. 31st Convocation of the IGNOU University is proposed to be in the last week of July 2018. The last date for online registration is 30th June 2018. Students are required to register Online for 31st Convocation. Those Students who have completed their Programmes in December 2016/ June 2017 term-end examinations are eligible for the award of original Certificate at this Convocation. Eligible students are required to register themselves for obtaining the degree/diploma certificate and pay the requisite fee through online mode only. They may attend the Convocation and collect the certificate at any of the Regional Centres or at Delhi, as per their convenience. 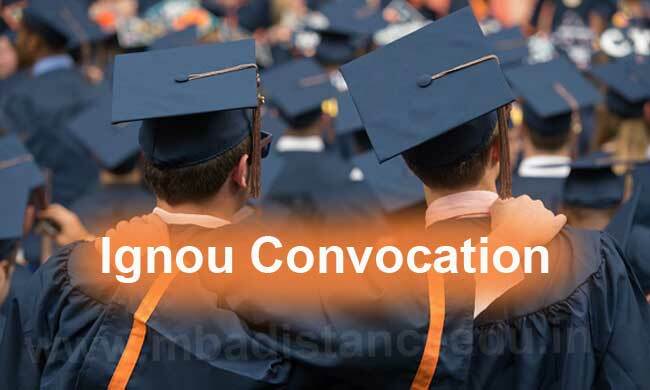 In case, Convocation is not held in the city opted by the student, he/she will be permitted to attend the convocation in the nearby city of the Regional Centre. The fee to obtain the original Degree/diploma certificate is Rs. 600/- per certificate to be paid through online mode only. The exact date of Convocation and other details in this regard will be announced in due course and registered students will be communicated separately. In case, students are NOT Invited to attend the Convocation or could not attend the Convocation even after submitting the requisite fee, their certificate will be sent by post, after the Convocation. Certificate/PG Certificate Programmes students are not required to register and pay the requisite fee. Their certificate(s) will be sent by post, after the convocation. For queries, if any, and discrepancy in payment of Convocation fee contact IGNOU Student Support at 011-29572209, 29572206.